IRON MOUNTAIN — A man arrested as part of a crystal meth investigation in Iron Mountain is set for a jury trial tonight in Dickinson County Courts. According to the Upper Peninsula Substance Enforcement Team, detectives saw a vehicle leaving a suspected drug house. Troopers from the Michigan State Police Iron Mountain Post pulled the vehicle over. 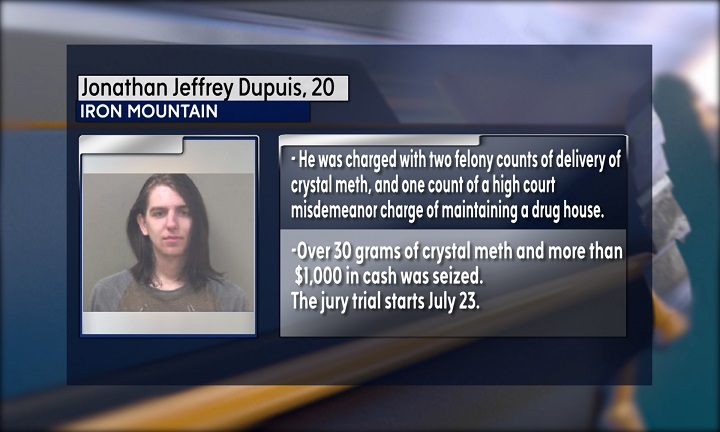 Dupuis was arrested for operating while under the influence of drugs. He admitted to purchasing drugs from the house he left from. Over 30 grams of crystal meth, as well as, more than $1,000 in cash was seized in the arrest.